Directions: Apply evenly to clean hands morning and evening for 10 days. Use as needed afterwards. Expect immediate results in 24 hours and with continued use. Ingredients: Aqua (Water), Dimethicone, Isodecyl Neopentanoate, Propanediol, Dimethicone/Bis-Isobutyl PPG-20 Crosspolymer, Hydroxyethyl Acryalte/Sodium Acryloyldimethyl Taurate Copolymer, Hydrolyzed Yeast Extract, Panthenol, Isohexadecane, Polysilicone-11, Glycerin, Alanine, Proline, Serine, Pseudoalteromonas Ferment Extract, Tremella Fuciformis Sporocarp Extract, Polyglucuronic Acid, Polysorbate 60, Xanthan Gum, Cetyl Hydroxyethylcellulose, Lecithin, Tocopherol, Betaine, Sodium Phosphate, Sodium Hydroxide, Citric Acid, Trisodium Ethylenediamine Disuccinate, Sodium Benzoate, Ethylhexylglycerin, Caprylyl Glycol, Potassium Sorbate, Phenoxyethanol, Chlorphenesin, Parfum (Fragrance). Winter life-saver!!! 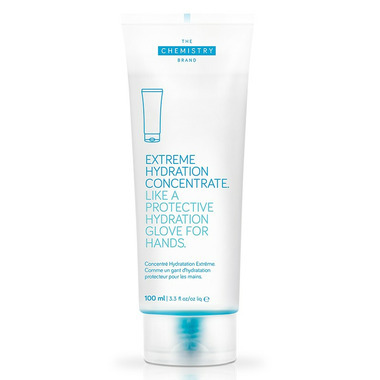 I get super dry, cracked hands in the winter and the Extreme Hydration Concentrate has changed my life. I usually cannot stand the feeling of hand cream, but this makes my hands super smooth. A little does go a long way as mentioned in other reviews, and it is not greasy. I honestly forget that Iâ€™m wearing it. This is my second tube this winter as I use it at least twice a day - especially before bed so that it soaks in overnight. Highly recommended. Helps my dry, cracking, eczema hands so much! It does leave the skin a tiny bit tacky if you apply a lot, but a little goes a long way. It has a clean, lemony sort of scent that I actually like because it's not too perfumey. Not fussy on this product. It has a bit of a 'slimey' feel to it and never seems to absorb into the skin. I would not buy this product again. I'm not sure what's in this product but it's brutal. As soon as I used it my eyes were burning and my throat felt like it was closing. I immediately washed it off. I have super dry and cracked hands. This product is very good. My hands feel great (not greasy). A little goes a long way. This product gives your hands the most amazing texture immediately after applying; its's hard to describe... but it's sort of velvety. It absorbs immediately without leaving a tacky, greasy feeling, Unfortunately, I suffer for VERY dry hands and this formulation is just short in providing the hydration I needed this winter; but as the product is such great quality, and feels soo good on the skin, I will definitely keep using it and hope they come out with a formula for worst case scenarios.